According to Dimon Sanders, the abuse started when she was 6 years old. She recalls being locked in a freezer and tied to a tree. She said she watched her sister get thrown across the room. It was a daily occurrence for Dimon until she was removed from the home of her biological parents at the age of 8, after the abuse was discovered. Dimon entered the foster care system. Between the ages of 8 and 13, she experienced 13 different placements — 13 placements with different rules, different curfews, different family dynamics, different values. She stopped caring about her grades. Adoption opportunities fell through. She acted out. Dimon was barely a teenager but was having to make decisions that could impact her future success. Would she run away from her group home? Would she shut down? And there, at the crossroads, she met Apache and Joshua Sanders, two incredible people who stepped up. Apache had known from a young age that she wanted to adopt. “I always knew that I wanted to adopt, just at the time I didn’t know it would be a teenager,” she said laughing. 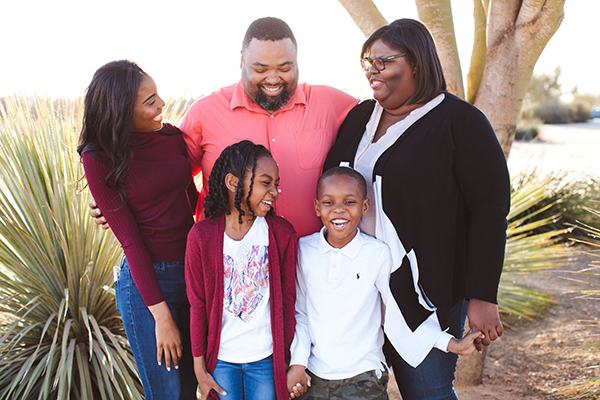 At the time Apache and her husband Joshua met Dimon, then 13, Apache said, “I was like 28 or 29, so having a 13-year-old wasn’t a part of the plan.” Nevertheless, Dimon and the Sanders family began to get to know each other. Then they began to trust in one another. The process took about a year. “At first, I felt skeptical because it’s not common for someone to want to adopt a teenager,” Dimon said. Plus, Dimon was worried that her at-the-time undiagnosed ADHD and need for supervision would affect the Sanders’ desire to build a bond. Dimon said Apache learned more about her, including the need for medications and supervision, and still wanted to proceed with the adoption process. “That gave me hope that maybe this one wouldn’t fail like my other ones did,” Dimon said. And the hope continued. Dimon and Apache’s bond grew stronger. Apache was able to be there, providing understanding and support for Dimon. When Dimon joined the Sanders family, she was also given the opportunity to pursue a passion she has long-loved – dance. “I started dance classes three years ago when I got adopted,” Dimon said. “I’ve always had a love of dancing, but never had the money to take classes.” Prior to taking a dance class, Dimon taught herself the basics, thanks to the internet. “YouTube was my best friend,” she said. In the summer of 2017, Dimon was crowned Miss Arizona’s Outstanding Teen, the first African American to win the competition. She is succeeding in school and has plans to attend college. She is open and honest, using her story to speak out as an advocate for foster care youth and the importance of community involvement. Imagine adopting three children in two years. Now imagine that all three of those children are less than one year old. For Elisia Manuel and her husband Tecumseh, they don’t have to imagine that scenario; they lived it. The couple, together for 20 years, was unable to conceive naturally. Elisia says that her sister-in-law, who aged out of foster care, opened her eyes to the world of foster care as she shared her stories of being in and out of homes. In 2012, Elisia began volunteering at a group home and, as a new foster parent, took in two boys. In February 2013, she received another sign: a call from her case worker saying they had a baby boy that needed a forever home in the form of adoption. The boy was seven days old when they met and brought him home. Four months later, they received another call, this time for a baby girl who was born just eight days apart from their son. “In a matter of six months, I had four children [at home],” she said. Despite having a large family, grown basically overnight, Elisia and her husband weren’t done helping children quite yet. A year after she received that first call about a seven-day-old boy, she received a call from her case worker about another baby boy needing a forever home. “Elisia, this is your son’s biological brother,” the case worker said. 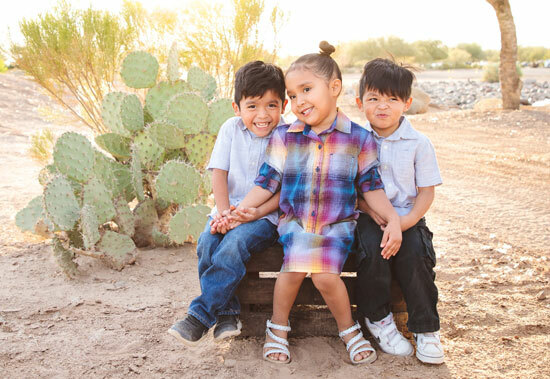 Following this incredible experience through the foster care and adoption process, Elisia and her husband started Three Precious Miracles, an organization that helps provides basic needs to Native American foster children and grandparents raising grandchildren. 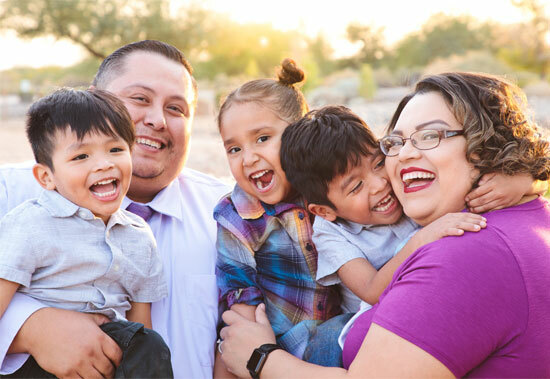 Elisia’s husband Tecumseh is enrolled in the Gila River Indian Community and they have seen a need for Native adoptive families and more support for kinship placements. Three Precious Miracles (named after the children’s three initials) runs off donations and fundraisers. Since its start date, Elisia says they’ve helped 800 kids. “If we can prevent child neglect or abuse by providing a simple item, that’s what I want to do. I don’t want to see kids forced into the system because their parents were having a tough time,” she said. Elisia continues to be a strong advocate for the foster care and adoption system. “We’ve had to jump through hoops, but now we are blessed with three children that are ours forever,” she said. No case is hopeless. The right adoptive family is out there. My story begins on October 20, 2014. I received a phone call from Elizabeth Wolfe, a DCS Case Manager. I was shopping at Home Depot and couldn't discuss it at that time but was able to hear the details the next day. Elizabeth was asking me to take a case with two teen boys, ages 14 and 16 at the time. These boys had been in DCS care since they were 6 and 8 years old. Parental rights had been severed two years ago, in 2012, so this was the second time these boys were in DCS Care. My first court report showed that the 16-year-old had been in 10 placements and the 14-year-old had been in 17 placements. The older boy was in a licensed foster home in Sierra Vista while the younger boy, Joseph, was in a therapeutic group home in Casa Grande. Joseph was about ready to be discharged from the group home for a standard placement. The placement that had been arranged for him was All The Kings Horses Children's Ranch in Benson. I was the one to transport him from Casa Grande to Benson. This placement only lasted one week. It took them that long to read his file and decide this was not the place for him. The next placement was a kinship placement with a sister and her family in Sierra Vista. This placement lasted three months to the day; his behaviors just could not be dealt with. 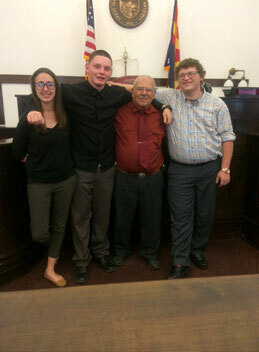 His next placement was with his brother in the licensed foster home in Sierra Vista. Joseph disrupted from this placement in a little over three months. The situation between him and his brother became dangerous; someone was going to get seriously hurt. 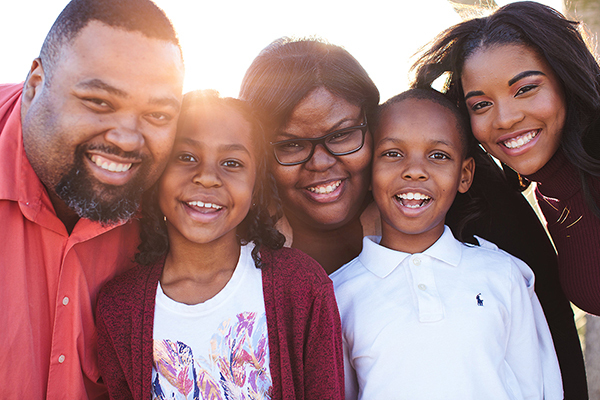 All along, Joseph professed a desire to become part of a family but since he had been in foster care since he was 6, he didn't even know what being part of a family meant. His behaviors were not conducive to reaching his goal of permanency. In early 2015, Joseph was selected to be included in the DCS Children’s Heart Gallery, a website for children who are eligible for adoption. When he left the placement with his brother, he was placed in a licensed foster home in Duncan, Arizona. Joseph loved to be in the center of town and this placement was on a farm in a very rural area of Arizona. He hated it. Whenever he talked about his placement, his comments were filled with 'F' bombs and other foul language. I was sure he would disrupt. He had been told he would only be there three weeks and we were now at that magical three-month mark. By this time I had developed the belief that this young man was unadoptable. There was no place that he would be able to maintain a relationship with any family. However, as time went on and school started after the summer break, this young man started to settle in. He became interested in sports and played on the school baseball, football, and basketball teams. He actually attended classes and received passing grades. He accepted being baptized into the Mormon Church. As the 2015-2016 school year went on, his attitude toward his foster family changed, as did his attitude about school and living in Duncan. In early 2016, he asked his foster family to adopt him. On November 18, 2016, Joseph was adopted. It took a very special and loving family to work through his issues, and in the end, become his mother and father (or grandma and grandpa as he calls them). If you find yourself with a very difficult case and start to feel it is hopeless to find permanency, remember, the right adoptive family is out there; we just need to find it. Every adoption story is special. Sometimes it’s the result of a new relationship and bond forming; sometimes it’s family members taking in a relative in need. In Tara Montgomery’s adoption story, an adorable 18-month-old boy came into her family’s life through a foster care placement and changed everything. 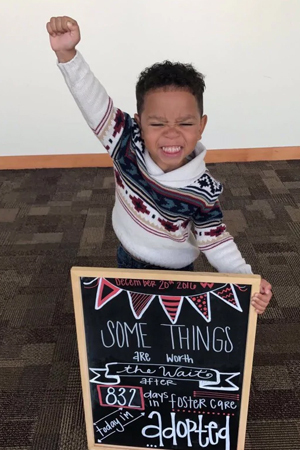 You may remember seeing a photo of the boy, raising his fist victoriously by a decorated sign that read, “Some things are worth the wait, after 832 days in foster care, today I’m adopted”. The photo was posted to Twitter on that special adoption day and proceeded to go viral. Below is Tara’s story, originally published in The Washington Post. Eight hundred thirty-two days. Worth the wait. These are only a few of the things I’ve learned about Michael since picking him up that day in early February. These small, unique details you learn about children — they make everything worth it. He went from “a foster child” to “my foster child” in the blink of an eye.